I continue to look at the effects of collusion on the carnival games, and today I worked on Four Card Poker. 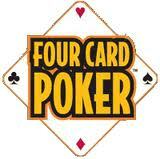 In Four Card Poker, each player is dealt five cards, from which they play their best 4 card poker hand. The dealer has the advantage of starting with 6 cards, but gives back some edge by allowing the player to raise 1-3x after seeing the hand. Also, one of the dealer cards is exposed. The simplest and most common strategy does not take into account the dealer upcard. The player simply calls 1x with a pair of 2’s thru 9s, and raises 3x with a pair of Ten’s or higher. This strategy yields a house advantage of 3.4%. I worked out a very simple collusion strategy, which only requires communication of dealer upcard copies amongst the confederates. 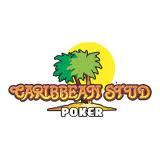 As I’ve pointed out in my posts on practical collusion for Caribbean Stud, it’s very easy to communicate how many copies of the dealer upcard the confederates hold (signal with chips, coughs, etc.). It’s very easy to know how many copies of the dealer upcard are left for the dealer to pair with. Using a simple strategy based on this upcard copies count, the house edge is cut in half down to 1.7% (on a full table). The table below summarizes the collusion strategy when playing on a full (6 player) table. Once you know how many copies of the dealer upcard are held by the players, you play your one-pair hand according to the table. Additionally, you should 1x call AK-high when the players hold all 3 copies of the dealer upcard. You have a pair of 4’s. The dealer upcard is a 6, but nobody holds a 6 in their hands (0 copies). Fold your 4’s. You have a pair of Jacks. The dealer upcard is a Ten, but noboby holds a Ten in their hands (0 copies). Just 1x call your Jacks. You have a pair of Jacks. The dealer upcard is a Ten, and you and your 5 friends hold one Ten between your hands (1 copy). You should 3x raise your Jacks. You have a pair of 8’s. The delaer upcard is a Jack, and you and your friends hold all 3 remaining Jacks (3 copies). You should 3x raise your pair of 8’s.